President Donald Trump took steps to advance construction of the Keystone XL and Dakota Access oil pipelines, while demanding a renegotiation to get a better deal for the U.S. government. Trump stopped short of green lighting construction on either pipeline but put a deadline on the government’s review of TransCanada Corp.’s proposed Keystone XL to transport Alberta oil sands crude to U.S. refineries. Trump also announced policies to encourage the use of American-made products in U.S. pipeline projects and to curtail federal environmental reviews for major infrastructure projects. “If we’re going to build pipelines in the United States, the pipes should be made in the United States,” Trump said. 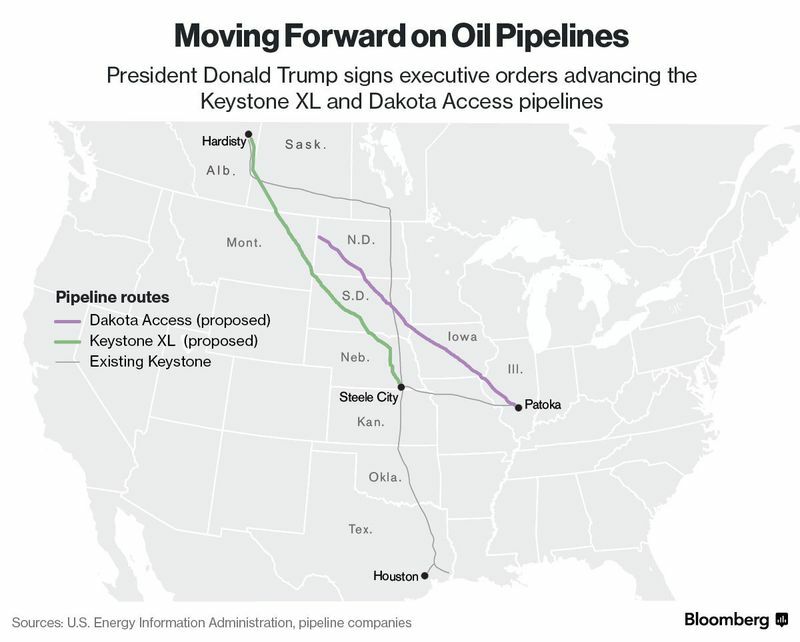 The moves, taken on Trump’s fourth full day in office, are a major departure from the Obama administration, which rejected the Keystone proposal in 2015 and has kept Dakota Access blocked since September. Environmentalists, concerned about climate change and damage to water and land, now face an executive branch that’s less sympathetic to their efforts. For the oil industry, it heralds more freedom to expand infrastructure and ease transportation bottlenecks. White House spokesman Sean Spicer cast that possible renegotiation of the Dakota Access project as a way to address concerns by stakeholders, including the Standing Rock Sioux Tribe, which is concerned about Native-American cultural sites and the safety of its water supply. While both projects will create jobs and grow the economy, they also will enrich the companies behind them, Spicer told reporters. “If we’re going to do all these things to expedite these projects that go over or under American soil,” then Trump wants to make sure American taxpayers get “the best deal possible,” he said. TransCanada climbed as much as 3.1 percent and was trading up 2.4 percent at C$64.02 at 3:23 p.m. in New York. Energy Transfer Equity LP and Energy Transfer Partners LP, the developers of the Dakota project, climbed as much as 4 percent and 4.8 percent, respectively. TransCanada is preparing its re-application and intends to submit it, the company said in a statement. The documents signed Tuesday include an executive order designed to expedite “high-priority infrastructure projects.” Under the directive, Trump said projects that win that classification from the White House Council on Environmental Quality will be given swifter reviews, under “expedited procedures and deadlines for completion” of necessary environmental analysis. A separate memo asks the Secretary of Commerce to develop strategies for streamlining permitting and reducing regulatory burdens for domestic manufacturers. About half of Keystone XL was set to be built with steel fabricated in the U.S., according to a 2012 breakdown from TransCanada of an earlier version of the project. Roughly a quarter was set to be supplied by Canada, TransCanada said at the time, with Italy and India providing the rest. Most of the Dakota Access pipeline is already finished, with 57 percent of the project manufactured in the United States. Canada has not received any formal notice of action by Trump on the pipelines but still supports Keystone, a project for which Canadian approvals remain in place. “It’s good for Canada and it’s particularly good for the people of Alberta,” Canada’s natural resources minister Jim Carr told reporters Tuesday in Calgary. Environmental activists vowed to continue battling both projects. To accelerate the Dakota Access pipeline, Trump directed the Army secretary to reconsider its earlier decision to conduct deeper environmental scrutiny of the project. The Army Corps of Engineers should consider relying on an earlier, broader assessment from July instead, Trump said in a memo. Project foes would almost certainly challenge any decision by the Army Corps to abandon the environmental analysis ordered under the Obama administration. 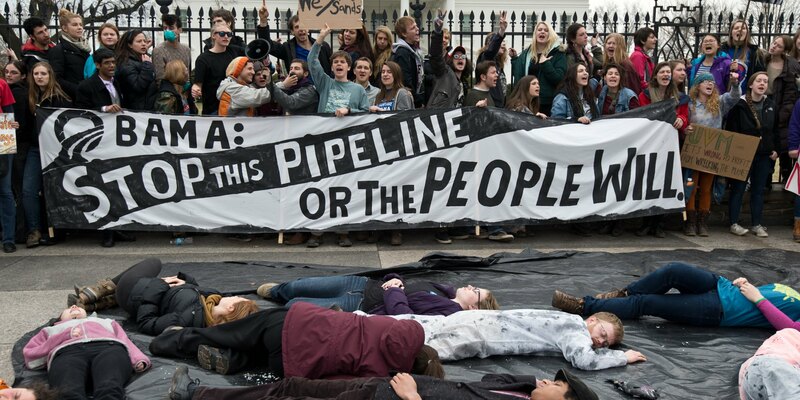 Trump compelled similar action to speed permitting of Keystone XL, asking TransCanada to re-submit its application for the project and giving the State Department a 60-day deadline for determining whether the pipeline is in the U.S. national interest. In a memo, Trump asks the State Department to rely on an earlier environmental review of the project for its determination, rather than conducting new analysis that could take months or years. The company’s plans for Keystone XL have already been vetted, with years of environmental scrutiny culminating in Obama’s 2015 decision rejecting the project. The makeup of Keystone XL has come under scrutiny before. When the Senate considered legislation that would force approval of the project in 2015, Republicans blocked attempts to require the project be built with domestically produced steel. Environmentalists fiercely battled Keystone XL, making it a flashpoint in broader debates about U.S. energy policy and climate change. Landowners in the pipeline’s path have warned that a spill of dense crude could contaminate the Ogallala aquifer, a source of drinking water that stretches from Texas to South Dakota. And activists said it would promote further development of oil sands in Alberta, Canada that generally require more energy to extract. Dakota Access opponents say the pipeline would damage sites culturally significant to Native Americans and pose an environmental hazard where it crosses the Missouri River. Earlier this month, the Department of the Army withheld the final easement necessary for construction beneath the lake. Swift approval of Dakota Access could reinvigorate the sometimes violent protests at the site of the proposed construction. Pipeline supporters said a final easement for the project would illustrate Trump’s commitment to building out energy infrastructure needed to ferry oil and gas around the U.S. Although Keystone XL would transport oil sands crude from Canada, some space on the line is slated to be filled by supplies from North Dakota’s Bakken shale play. Dakota Access, likewise, is aimed at giving Bakken producers a new route to energy markets, allowing them to forgo more costly rail shipments that have been a backstop when existing pipes fill up. With a capacity of about 470,000 barrels a day, Dakota Access would ship about half of current Bakken crude production and enable producers to access Midwest and Gulf Coast markets. Energy Transfer owns the Dakota Access project with Phillips 66 and Sunoco Logistics Partners LP. Marathon Petroleum Corp. and Enbridge Energy Partners LP announced a venture in August that would also take a minority stake in the pipeline.